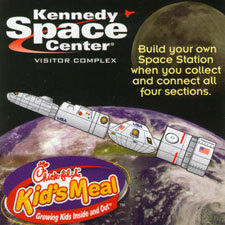 Chick-fil-a has teamed up with NASA's Kennedy Space Center for their latest Kid's Meal premium. It's part of Chick-fil-a's longstanding "Growing Kids Inside and Out" program that aims to educate and inspire their younger customers with the prizes they put in their Kid's Meals. 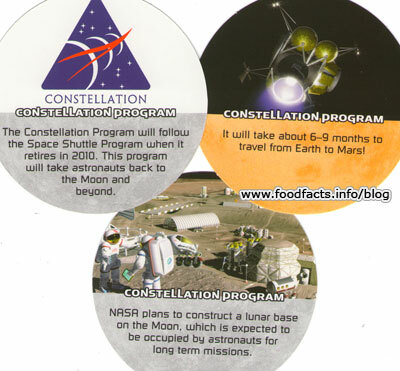 Each Kid's Meal will contain one of the 4 parts shown above to create a miniature version of the Space Station. The piece I've got, the Command Center (second from right in the picture), has 8 double sided round cards (examples below) with facts about NASA's Constellation program, the program that follows the Space Shuttle. With facts about planned trips to the Moon and Mars. Chick-fil-a also wants you to remember that Men's Health magazine recently recognized Chick-fil-a as "America's Healthiest Chain Restaurant for Kids." The Chick-fil-a Kids Meal includes a choice of Chick-fil-a Nuggets or Chick-n-Strips and a variety of side choices, including Waffle Fries, dessert items.